Visit Us at ARA, Booth 2616 - Win a Tablet! JLG will be at ARA in Las Vegas from February 11-13, 2013. Be sure to stop by Booth 2616 and check out the full range of customer services offered by our Ground Support team, including training from JLG University, aftermarket parts, used and reconditioned equipment and repairs. And enter your business card at our booth for a chance to win a tablet – there will be one winner each day! Also at the show, we will have some of our high-demand products, including the updated JLG® G5-18A Super Compact Telehandler, redesigned for 2013 to comply with Tier 4 engine regulations and provide enhanced visibility. Learn more about what we will be exhibiting at ARA this year. We look forward to seeing you there! 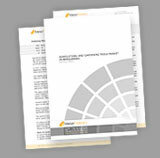 Now you can get everything you need to know about SkyTrak and JLG telehandlers in convenient e-books. These handy, portable reference guides for the iPad® provide basic information, like product specifications and dimensional data, and also contain videos and image galleries with high-definition quality. Get an up-close view of the full range of telehandlers along with the many attachments and accessories. 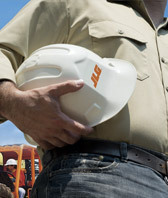 Interactive elements, like our embedded distributor locator, make it easy to locate a JLG dealer nearest you. Download your free copy of the SkyTrak or JLG e-book today. You can also register to win a tablet. Tablet giveaway promotion begins December 11, 2012 at 9 AM (EDT) and ends at 11:59 PM (EDT) on March 15, 2013. United States residents only. A winner will be notified via email on March 21, 2013. The international construction equipment market is expected to continue its growth in 2013, according to Global Industry Analysts, Inc. Its new report — “Construction Equipment: Market Research Report” — points to the upsurge in urbanization and the increase in demand for construction equipment from residential, commercial and infrastructure construction sectors as major factors in the market’s growth. The report, which analyzes worldwide markets for construction equipment, also predicts the production of construction equipment to exceed 1.75 million units worldwide by 2018. Get the full report. The nation’s construction industry gained 30,000 jobs in December despite an overall increase in the industry unemployment rate, according to the February 4 employment report by the U.S. Labor Department. That is the fastest pace of construction employment growth since February 2011. Sectors that gained jobs include nonresidential building construction, adding 7,000 jobs in December, residential building adding 5,800 jobs and residential specialty trade contractors adding 12,300 jobs. 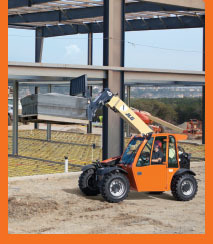 Get around the job site easily and tackle heavy lifting jobs with the JLG® G5-18A. The machine height of less than 76 inches gives you access to places other machines can’t go. And with the tight 126-inch turning radius, you can maneuver around obstacles with little effort. This super compact telehandler has a maximum capacity of 5,500 lb and almost 11 ft of reach with 18 ft of lift height, giving you all the power you need for the most productive day possible. With constant changes in the construction industry impacting the way you work, we’ve asked experts in the field to share their insights on topics important to how you do business. This month, Nathan Medcalf, Editor, Equipment Journal, gives us his take on this year’s construction equipment trends among rental companies and end-users.